I am planning on building a 5'x10' trailer (not including tounge) with a single 3500 # axle trailer for a couple smokers. 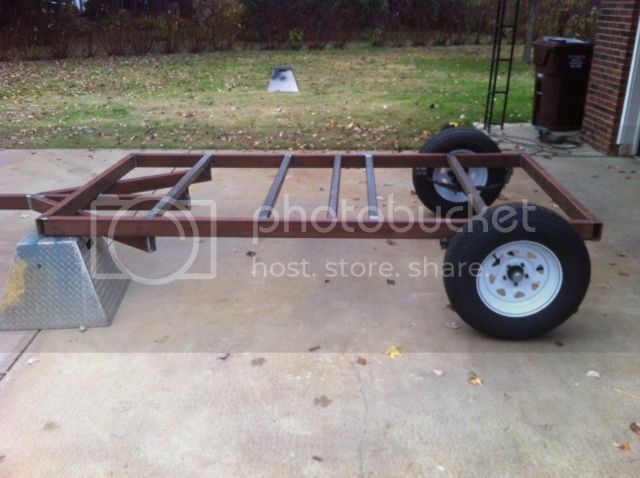 My question is what material and gauge should I use to frame out the trailer? I also thought about framing the whole trailer out using all C channel. If I were going with the C channel I would use 4" 5/4 Channel iron for the whole project. You can use 3" x 3" angle for your cross members. Troy will be in here in a minute to line you out on tubing that is what he uses for his yard trailers he builds. I would personally use 2x4 tubing for the build, but that is just my preference and what I use for all of my trailers up to 18'. I have used 2x3 on a 6x12 trailer before and it worked out just fine. Either way you go, I would use 11ga tube for the frame and cross members and definitely step up to the 3/16 or even 1/4 for the tongue rails. The 11ga cross members will be plenty strong for the build because your cookers or components are going to be welded in place and never move, so they are basically going to become part of the framework. This is a 5x10 I built for the X4 BUILD, it is 2x4x1/4 framework and tongue, but that is what I had scrap of laying around. The cross members are 2x2x11ga except for a 2x4 tube I used where the cooker would weld to the framework. I would go with angle and channel. tubing can hold water inside and rot from the inside out. If done right you will have no problems at all. Weld all your seams up solid and you wont have any issues. Any moisture from humidity that does accumulate over time will evaporate in summer months because of the temps. You can also weld 3 sides of the tube and leave the bottom not welded so any moisture there is can drain, or you can weld solid and drill a couple weep holes in the tube for drainage if you think its a concern. 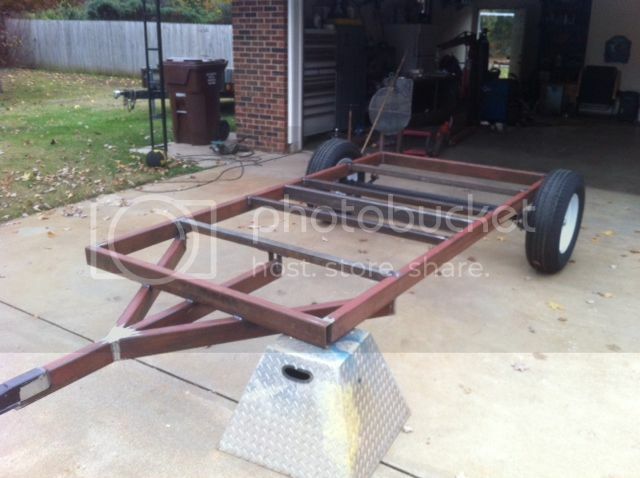 I built a trailer out of tubing that was 17 years old when it got T boned at an intersection and I cut it up for scrap for the owner before building him a new one. The steel on the inside was just about as clean as it was the day I built it. All you have to do is do the work right the first time, and it will last you a lifetime. I made my comment for a amateur welder. And I have worked on my fair share of rusted trailers. I made my comments for the amateur welder as well, giving 3 different ways it can be done and not have any concerns for moisture building up on the inside that would cause any long term problems. 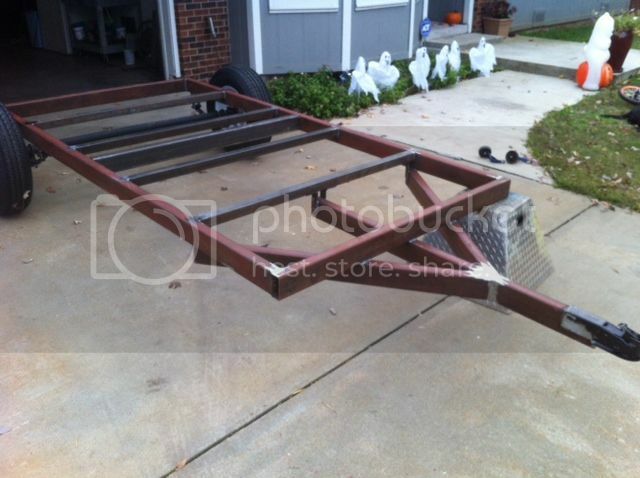 I too have welded my share of rusted trailers, and with that I have learned what works and what doesn't work. This a discussion, not a argument. Who is arguing All my comments have been made in the mode of discussion. I can recap the discussion for you if you need? No need to recap, Iz just a welder. Typed words are hard to portray feeling or emotion. The only tubed trailers I have ever seen rust were boat trailers especially in salt water conditions Most boat manufacturers are now going to the tubed aluminum and some of the higher end boat companies are using aluminum I beam on their large offshore trailered boats. Almost all high end trailer builders I know of from utility to 30,000 cookers use tubing now. The 5/4 channel is a bit stronger in long spans but it is also heavier in finished weight so choosing your material wisely is always a good idea. I hide under that leaf, truth be told It's my welding and fabrication company. Posted: Thu Jan 21 16 10:19 am Post subject: Thanks! Thank you for all of the input, I appreciate it all. A little off the subject but I'd add for thought. We just built another irrigation pivot at our farm. The Zimmatic had the best, most complete galvanize I'd ever seen! I did a bit of research and understand that Zimmatic has a 50' dip tank in NE. Great welds and totally galvanized for long life. If I could sneak in some stuff....Jeep frame, trailers etc! Trailerbuilder, looking at your trailer photos I couldn't help notice your chickens could use some vitamins or something.
. I think we've just got a regional difference here; I wouldn't have a bit of problem in a standard freshwater lake area doing a boat trailer out of just painted steel rectangular tubing; however, k.a.m. and I both live in the land of saltwater trailers; there's people down here that build 5x10 utility trailers out of stainless and aluminum just so you don't have to jack with it. I had to think long and hard about channel vs. tubing on the one I'm building now, just figuring out the odds of it making a beach trip or ten, and how that'll affect longevity... I really think it's an issue here. I really live a long way from the coast, and I honestly think there's a difference in just how fast steel rusts here depending on whether we've got a north or south prevailing wind that week.. I couldn't agree with you more. Its all about the region for sure. And you have to be careful when picking your materials in those regions. Ive seen stainless steel rust away as well, of course it was a chit grade of stainless, but when you pay the money for stainless steel, you think youre getting the best of the best. Not always the case.